We had a busy Saturday! After our Australia Day BBQ was a wash out last week, we moved it to Saturday instead. Spent the morning setting up and rushing out for last minute things, had a wonderful time at the BBQ, and then we went to the in-laws for a family feast for Chinese New Year. Lots of good company and good food, but I was exhausted and ready for bed by 9pm, haha! Had a new red top in mind to change into for dinner, but after everyone left from the BBQ I didn't have a lot of time or energy to change, so I wore the same maxi dress I'd worn during the day. Certainly was comfortable for both occasions. Last worn: Rayban wayfarers, feather print maxi dress, Havaianas, Balenciaga sang flat clutch. 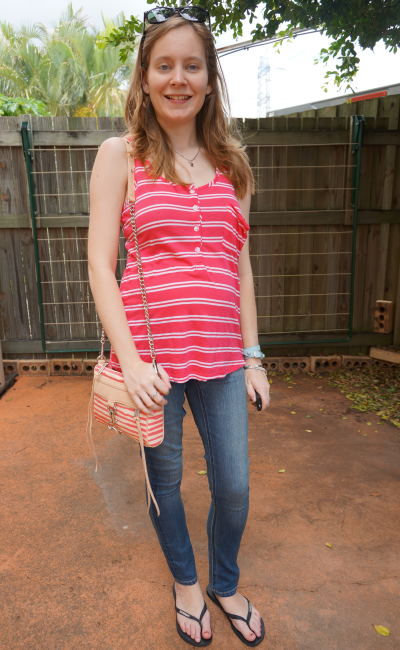 Last worn: Splendid stripe tank, maternity skinny jeans, Havaianas (see above), Rebecca Minkoff canvas mini MAC. 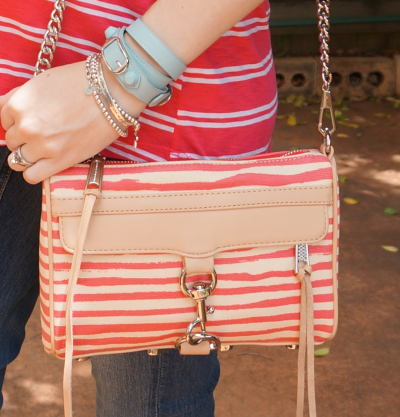 Linking up with Monday Must-Haves, Mix It Mondays, Manic Monday, Style Sessions today. That feather print dress is lovely! How lovely Mica....you are so making me miss my maxidresses!! Cute looks as always! I love your bags. It's already starting to get cooler here...I think if I can pick them up on sale I might, but they are a little exxy at full price. I love the House of Harlow necklace, my best friend has it, and you look stunning in skinny jeans! Both your outfits are adorable! I really love the first one though! The dress flows perfectly and your dog is the cutest pet ever!! that first dress is beautiful, and i love how you styled it with the bright bag! You look amazing :) love your outfits!! Love your Balenciaga bag, you always have the best bags ! Your glowing! No hiding that bump! You are stunning in that feather dress, Mica! Just gorgeous. I love that red B clutch. I love the summery maxi dress that you're rocking in the first photo. Both of your handbags in this post are stunning as well!! You really have a great sense of style. The maxi dress is so pretty and I loved it paired with the Balenciaga clutch. 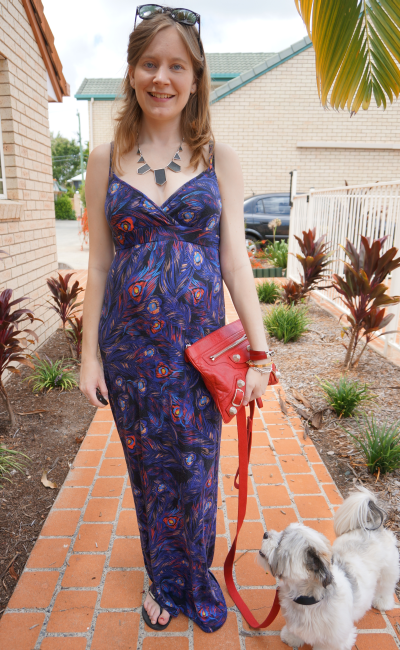 The feather print maxi looks great on you! I hope it has room for your growing bump, 'cause it looks really comfortable. That peacock feather print is so pretty! love the print of that dress and your striped bag! Absolutely love the purple printed maxi dress. You look adorable. :) Take care. Love the color of your dress! I'm jealous you have weather good enough for it. that feather dress looks amazing on you mica! i love the print. even Cooper is looking up at you. fabulous casual outfit. 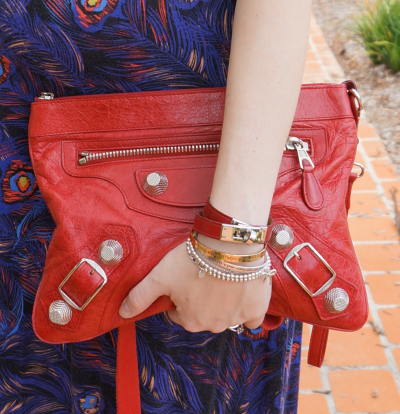 I am totally in love with the Bal clutch! I have a few City but never a clutch.. now, why is that?.. tempting! Oh my goodness, Mica!! I sure have missed a very important and blessed development!!! :))) Congratulations, my friend!!! How incredibly exciting!! I am going to back track through your posts to find the announcement...jumping for joy for you! Oh man - both bags are just amazing! So gorgeous! Thanks for sharing this with manic Monday!